Leaves falling from the Holy Tree was composed in 2001 in memoriam Nicholas Black Elk, holy man of the Oglala Sioux. As a teenager, I first read the book, Black Elk Speaks, an autobiography in which Black Elk recounts his spiritual journey from young boy to old man. This man’s life story had an enduring effect on my own spiritual quest and awareness of the world. The power and force of his great vision; the thrust and travels of his life; the melancholy that seemed to invade his later years, when as an old man he felt he had failed his people as a spiritual leader––all of these aspects are interwoven into the various textures, musical imagery, and emotions of this orchestral piece. 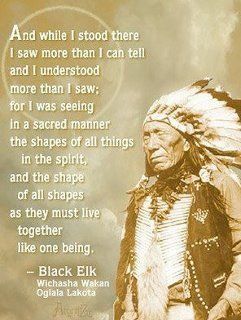 Following is an excerpt from Black Elk’s account of his great vision. From Black Elk Speaks: Being the Life Story of a Holy Man of the Oglala Sioux / Nicholas Black Elk, as told through John G. Neihardt. Used by permission of the University of Nebraska Press. Copyright © 1932, 1959, 1972 by John G. Neihardt; © 1961 by the John G. Neihardt Trust; © 2000 by the University of Nebraska Press.